If someone asks what is the speciality in Sapa, it must be “Thang Co” as the first recommendation. Originating from Sapa ethnic’s traditional food, it becomes one of the most terrific characteristics of the upland, which seduces lots of tourists to the North West of Viet Nam to come and enjoy. Besides exploring the best-view ever of Sapa, tourists coming to the fog land can enjoy its delicious and distinctive Thang Co. There are a variety of stories telling about the origin of Thang Co and its name, but it maybe is the final answer that Thang Co is one of the Mong’s creation. It is said that Thang Co appeared in Vietnamese cuisine map 200 years ago, when the Mong, Tay and Nung ethnic moved to Bac Ha – the North West Zone for residence. The name “Thang Co” is considered to originate from “Thoang Co” as the way the Mong ethnic call it or “Khau tha” meaning “Meat soup”. Another suggestion is that Thang Co is a phonetic variant of Thoang language in which “Co” means “soup pot”. 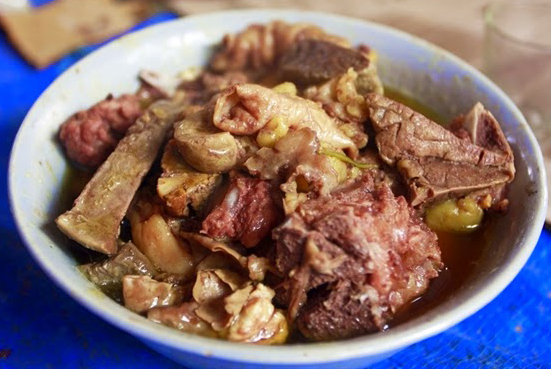 Despite its various origins of names, Thang Co is a traditional food of the Mong ethnic. One typical characteristic of the traditional Thang Co was that the main ingredient was horse meat, instead of the more diversified kinds of meats as the main ingredients like pork, beef, buffalo meat as the recipes of other ethnics like the Kinh, Tay, Nung do it nowadays. 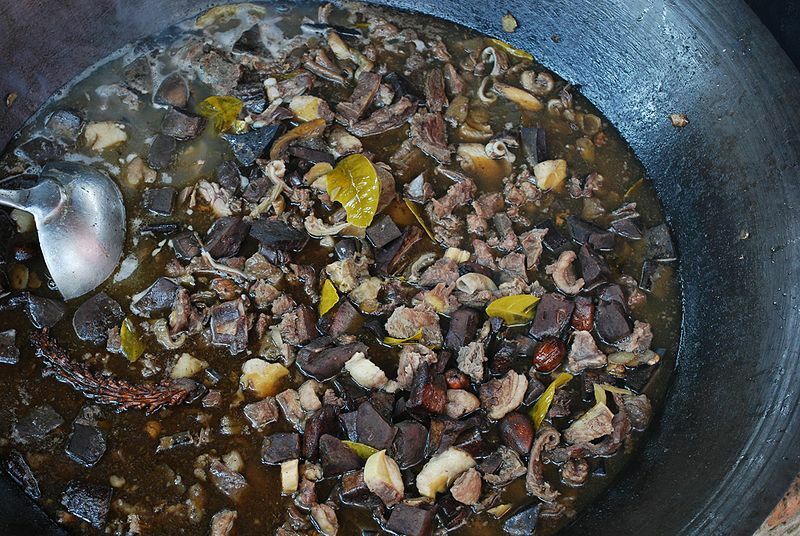 Previously, as the main ingredient of this food was horse meat and horse force was one of the most crucial means of transport and delivery of the ethnic, Thang Co was only served on the special occasions like Tet holiday, village’s big crop festivals or enjoyed in the large fair like Bac Ha fair which was not held regularly. But now, for the replacement of the new ingredients like pork and beef and the development of Sapa satisfying with tourists to this land, particularly the gastronomes, Thang Co is more popular and served in more places. Each kind of meat owns its featured flavor; however, Thang Co made from horse meat, so-called “Thang Co Ngua”, may obtain the best flavor and taste. In spite of its unique flavor, the cooking process is simple. All spices remain the best flavor of the North West, where the ethnic’ daily life depend much on the natural resources. Traditionally, it contained twelve kinds of spices creating the authentic Thang Co, in which it must have cardamom, citronella, ginger, star aniseed, cinnamon twig and others, and Thang co plant was the twelfth element. 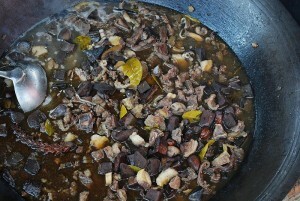 All the ingredients are simmered with boiled water for hours in the pot. The first step is obviously ingredient preparation, in which horse meat (beef, pork and even goat meat) and edible viscera or internal organs are cleaned and then chopped up into pieces to be marinated with traditional spices after that. Next step, the Mong usually use a kind of stove which requires all-time operated so that it can supply heat during cooking Thang Co. For a more tasty dish, it is added with backbones and ribs to make the soup more flavoured and sweeter. It maybe is a featured characteristic of Thang Co when it is used a big pot or a kind or a kind of deep-fry pan instead of a common pot and the pot is always seethed even when eaters are enjoying it. Actually, enjoying Thang Co is more convenient and easier than ever because you just need to travel to Sapa, enter to a certain restaurant or big food stall, you can order a pan of Thang Co, which is prepared for 4 to 5 eaters or order for yourself a bowl full of yummy meat and tasty soup serving with some vegetable like “Cai meo” (a kind of colza), “cai lau”. You may find the viscera tasty and not overdone though it is simmered for a long time while the meat is soft and flavored. Nowadays, it is not only the Mong who can make this dish, but the Tay, Nung, Dzao and Kinh are able to prepare it with more choices of ingredients and the ad dition of variant spices. However, Thang Co of the Mong and Thang Co ngua (Thang Co with Horse meat) at Bac Ha fair are two of the top searches when travellers coming to Sapa want to enjoy the specialities here. If you cannot meet a Thang Co with horse meat, you should try the instead of beef because Thang co beef is considered to get closest to the original Thang Co ngua. One typical characteristic when enjoying the traditional Thang Co lies on the way it served. Eaters usually ladle it out bowls during the pot is seething, even when eating the dish, it is still in seething. Remember that besides the origin and location, you should enjoy the dish with a little ethnic wine and Ban Pho Corn Wine is the best recommendation for you experiencing the authentic taste. If you do not have enough time, you can enjoy this flavoured kind of food in restaurants such as Fansipang Restaurant at 23 Cau May, Red Dao Restaurant at 4b Thac Bac Street, and Thang Co a Quynh at 15 Thach Son, Sapa Town or others. In some cases, tourists do not want to eat at the markets, they often try the dish in restaurants. However, it is more recommended having the dish in fairs and markets in Sapa, especially in Bac Ha fair, to get the real and authentic taste of the food. Obviously, Thang Co Bac Ha is an one-of-a-kind dish which contains both the exotic flavor and unique recipe of the North West. Anyway, if you trip to Sapa, you cannot miss this one-of-a-kind speciality of the mountainous upland. In addition to Thang Co, there are some highly recommendations for you getting all the best flavour ever of Sapa, including Sapa Cap Nach Pigs, Sapa Chinese Black Mushroom, Sapa Pau Play Day Cake, Khang Gai Dried Meat, Sapa Fructus Crataegi Wine and more.